Sunday morning at 7:00 AM I took to the KFAB airwaves for our weekly Compute This radio show (available free on iTunes) to announce the opening of the Service Center that afternoon. The show was awesome and I left the studio a little less nervous than when I got up that morning. We had over 100 people come in that Sunday (10/10/10 no less) and nearly all of them brought computers in for a discounted Preventative Maintenance Checkup. 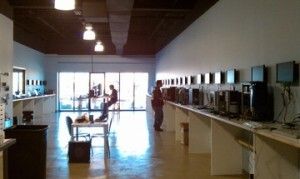 In 2008 we built a state-of-the-art Service Center in Lincoln, NE. We got a lot of things right when we built that, but we also could have done a few things differently. For example, we built the walls in the new Omaha Service Center all the way to the ceiling to help reduce echo, we shortened the distance from the front desk to the front door, and we leased two full bays – one for retail and service and another for repair. The new configuration allowed us to install 40 bench spots (as opposed to Lincoln’s 26) – and thankfully so. As you can see in the picture above, the bench is full! What’s Next for Schrock Innovations? Wow, good job. And we look forward to your Holiday special and Black Friday event.. Sounds like 10/10/10 was a good omen for you. Can’t wait to learn more about the new software product!